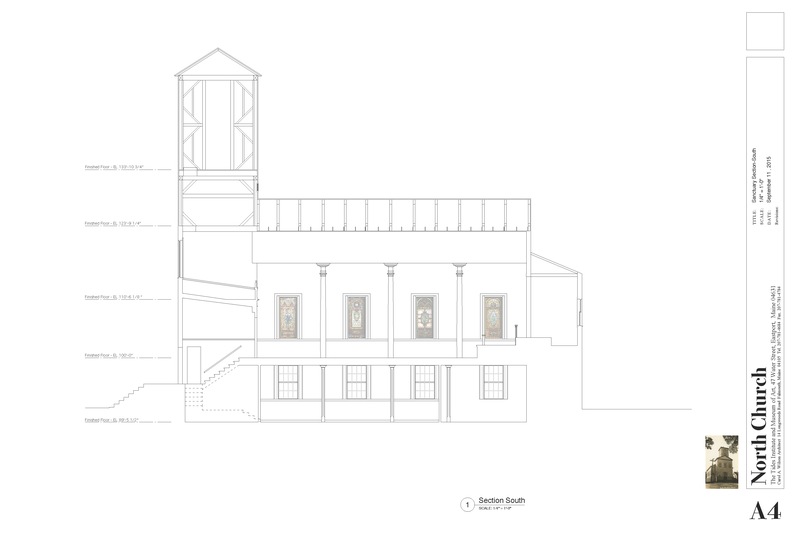 TIMA is developing its 1819 North Church building as a 4,000 square foot project space that serves as an extension of its artist residency, exhibition and workshop programs including performances, site-specific art installations, multi-media presentations, along with ground level working studio space. A plaque on the wall of the main space notes: “This repurposed space is in honor of Bob Tuckett, Sr. and Polly Mattis Tuckett whose selfless love of family and community is remembered.” Below can be found photographs of the project space over the past three years as it has been used for installations and performances. A custom made Schlicker chamber organ (not a church organ), designed for solo and ensemble Renaissance and Baroque music and obtained from Brooklyn, New York, was recently installed in the rear addition of the building. The organ was originally built for an individual in New York City. Two architectural plans (floor plan of main sanctuary space and building profile) of the space prepared by architect, Carol Wilson, can also be found below. Main sanctuary space of the North Church with 23 foot high vaulted ceiling and exceptional acoustics. 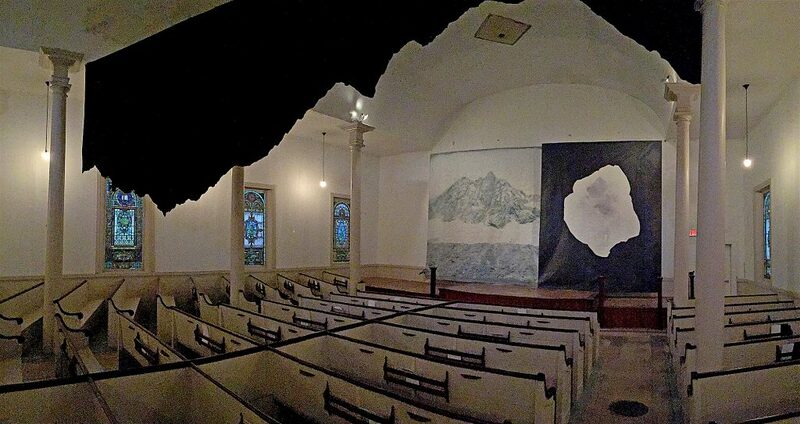 “Sardinia,” a large scale site specific installation in the main sanctuary space of the North Church by 2016 artist-in-residence, Janice Wright Cheney of Fredericton, New Brunswick. The installation included sound, sculptural elements and projected imagery. For a short video of the installation, click here: Sardinia. 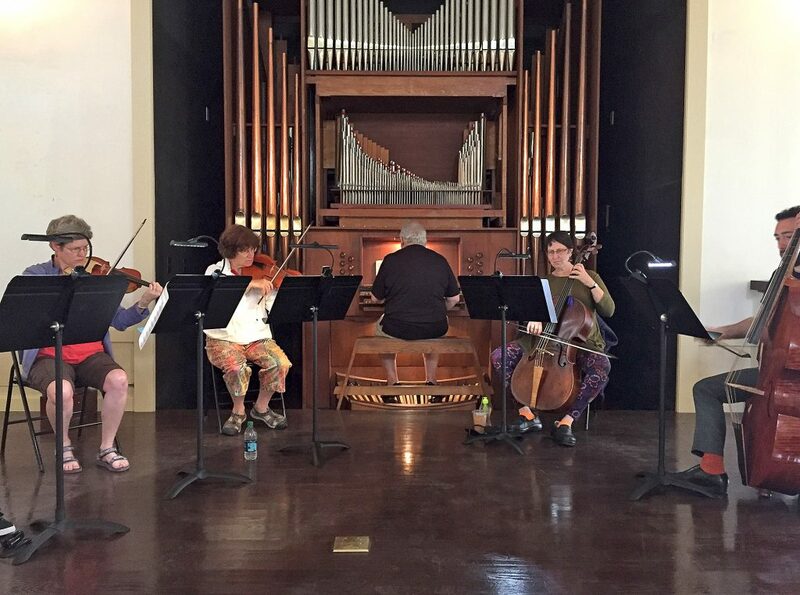 2016 Concert in the North Church Project Space by baroque quartet from New York City and Philadelphia. The quartet was in residence for a week before the performance. 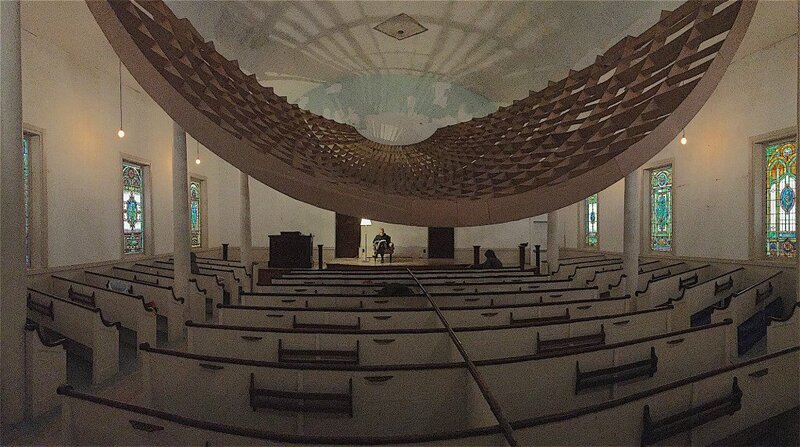 “Undertow,” a large scale site specific installation by artist, Anna Hepler of Eastport, Maine and now of Greenfield, Massachusetts, that was fabricated at the North Church building’s ground floor and then installed in the main space in late July, 2016. For a time lapse video of the installation, click here: Undertow. Fabrication of “Forever,” a site specific installation, on ground floor of the North Church in 2016 by returning 2015 artist-in-residence, Alicia Eggert, of Denton, Texas. Eight foot tall letters spelling out “Forever” were cut out of plywood, painted black, and then transported to the top of a small nearby island in Cobscook Bay and mounted on scaffolding for viewing. Click here for a time lapse video of the installation: Forever. “Forecast,” a large scale site specific installation by artists, Shoshannah White of Portland, Maine and Charley Young of Halifax, Nova Scotia, that was developed at the North Church building’s ground floor and then installed in the main space above with an opening on August 18, 2017.
at North Church on July 11, 2018 with newly installed custom made Schlicker chamber organ. For a short time lapse video of the organ installation, click here: Schlicker organ. 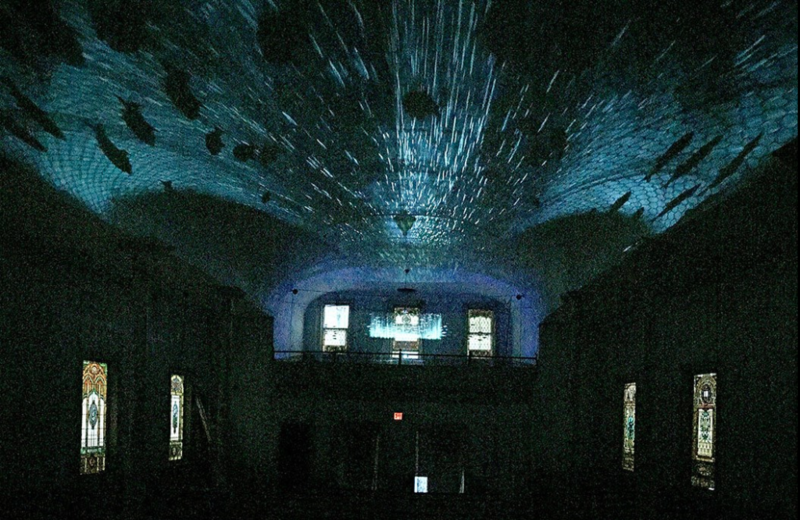 “she’s ever present,” a large scale site specific installation by artist, Sarah Hewitt of the Belfast, Maine area, that was developed at the North Church and then installed in the main space with an opening on July 27, 2018. Scott MacLeod, artist-in-residence from Oakland, California during August, 2018, transformed the North Church ground floor studio space into a temporary Museum of Dubious Navigation including ship models and other sculptural works created during his 4-week residency term. 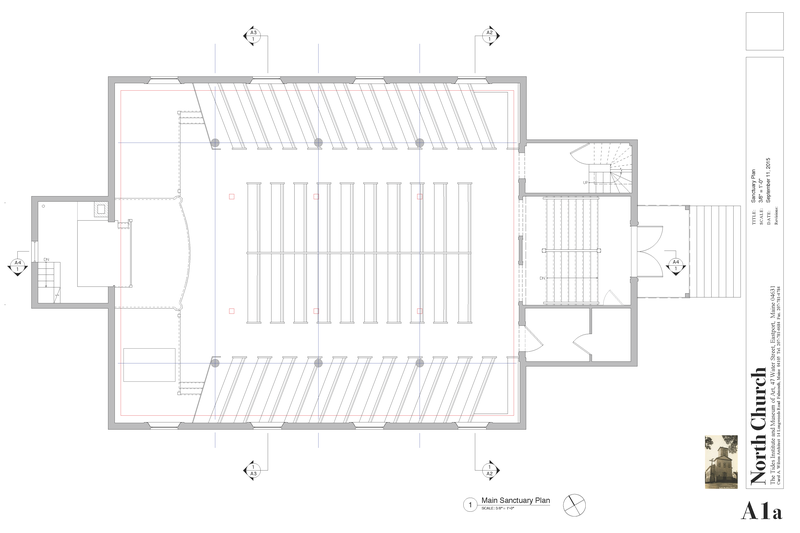 Floor plan for main sanctuary space of the North Church by architect Carol Wilson with assistance of Becca White. Profile plan of the North Church by architect Carol Wilson with assistance of Becca White.